My plan for today had the largest amount of cumulative climbing for any of my days – a little over 1500m – onto Dartmoor. So I was dreading the climbing a bit, but greatful that today’s weather was notably cooler. I took a wrong turn fairly on in the day, so didn’t quite take my planned route. I adjusted my route accordingly and this will actually mean that I did even more climbing than planned in the end. Not too long after passing a sign welcoming me to Dartmoor National Park it started to rain. At about the same time a series of cyclists turned onto the road I was following 100m or so ahead of me. It turns out that there was some kind of organised cycle event on Dartmoor today together with marshals at the junctions I encountered. As I climbed into Dartmoor I passed some of the riders, but was slightly slower than the majority of them. One of them commented “I don’t know how you do it with all of that!”, referring to the fact that I was pretty much keeping pace with him on his unladen bike while I was carrying four panniers, a rack bag, and a handlebar bag. I had an advantage on the event riders though in that it looks like they had to go a bit further on the moor whereas I was stopping at Princetown for my accomodation. I also had an OS map in front of me with the contours, which used together with my GPS’s altimeter (even though that’s not entirely accurate) helped me plan my ascent reasonably well. When I’d achieved most of the final climb for today I even had my photo taken by one of the event photographers. I think that having other riders around prove very helpful with giving me a pace to latch onto, the rain was helpful in keeping me cool too. I feel proud that I was keeping up so well, and I hope it bodes well for the other tough climbs I’ve still got in some of the days ahead. In the end I arrived a little over 3 hours early at today’s accomodation, so I’ve been out to have a snack and found a cafe that claims to have WiFi access. I’ve got a rest day planned tomorrow, so I’ll probably be spending quite some time there catching up on some data entry. This entry was posted on Sunday, June 28th, 2009 at 16:29 and is filed under Cycling. You can follow any responses to this entry through the RSS 2.0 feed. You can leave a response, or trackback from your own site. That was the Dartmoor Classic you were caught up in. It’s a 100 mile cyclo-sportive around the moor. I did it last year but am not fit enough this time around. 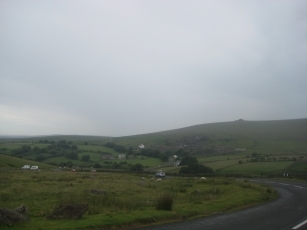 The climb up to Princetown is after about 80 miles so if the riders were like me last year they would be pretty tired. Good luck with your ride. Well, I’d only done a little over 20 miles by the point I met them, so it’s not surprising that they were a bit more tired than me. Greg, just caught up with your blog. Looks like you are progressing very well, look forward to some more blog entries.